What? Brandy is distilled from wine! The Dutch first distilled wine to make it last longer during transfer and called it brandewijn, meaning burned wine. Thus, brandy. I believe this fully justifies having a brandy as a wine pick. So nanny-nanny-boo-boo. The burned wine of Germany is weinbrand and they make a whole lot of it, mostly from wine imported from Spain made specifically for distilling. Growing conditions are hard in Germany and it would be a shame to distill their wonderful Rieslings or other varietals. Of course, the distilling and aging is of their own work and how they separate their weinbrand from the other brandies of the world. 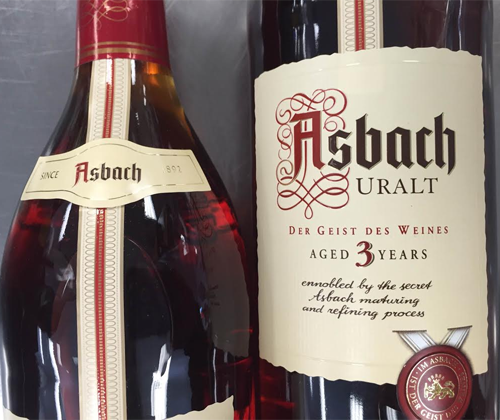 Asbach Uralt has been doing their thing since 1892. Their brandy is distilled several times and aged for three years in Limousine oak. It's got a wonderful gold color with a red hue. There's a nutty Sherry-like character on the nose along with apricots and caramel. It's heavy in the mouth and it manages to have a smooth mouthfeel while being fiery right off the bat. Plum, leather and pepper join caramel and apricot on the palate. It finishes with caramel, leather and intense heat. This is the brandy for rye whiskey drinkers or an excellent alternative to Armagnac. And for $27 it's simply one of the best brandies that you can get for your money! The bottle used was purchased by myself for purpose of this unpaid review. To have your wine reviewed follow this link.